RANGE magazine makes historical archives available to the public | RANGEfire! In a process that has taken well over a year, RANGE magazine has created an interactive archive of all its past issues, starting with Spring 2017, going back to its inaugural edition of Spring, 1991. Called RANGEdex, the archival treasure trove can be accessed by going to rangedex.com. More comprehensive than the “Back Issues” feature on the rangemagazine.com homepage, RANGEdex provides readers access to full editions as they appeared in their original form, complete with the original text, fonts, layouts and historic RANGE photographs. RANGE brought on a talented technology student from the University of Nevada Reno to create the complex archival library, and the process of making it intuitively searchable through keywords and images is ongoing. Needless to say, RANGEdex is a window into the recent history of the American West. 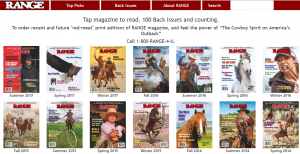 As RANGE magazine is considered a treasure by subscribers and contributors, this beautifully composed website is a gift to thousands. As you peruse past issues you will find pensive reflections on the past, compelling stories of contemporary ranch life, and forward-looking reports about the issues that continue to dog ranchers, property owners and all who love and work the land.